Check prices for accommodations in Riviera Maya at Booking.com, Hotels.com, or HotelsCombined.com. Read reviews about hotels and guest houses in Riviera Maya, Mexico at TripAdvisor. Amazing photo! Captures everything beautiful about the beach. Sun, sand, refreshing water and awesome power. Thanks Dan! Glad you liked it. Tulum had the most amazing sand I’ve ever seen. Powder fine and soft. Amazing picture, thanks for sharing! Have always loved the Mayan Riviera but yet to venture further south to Tulum. Definitely next on my holiday list! Glad you liked my story, Rob. Hope you make it to Tulum some day; the beaches and the Mayan ruins there are really beautiful. I’ve been to this exact spot. If you look up and to the left there’s some stairs leading the the ruins. Amazing you shot it without people! Hi Destination: Yes, got really lucky to get it without people. 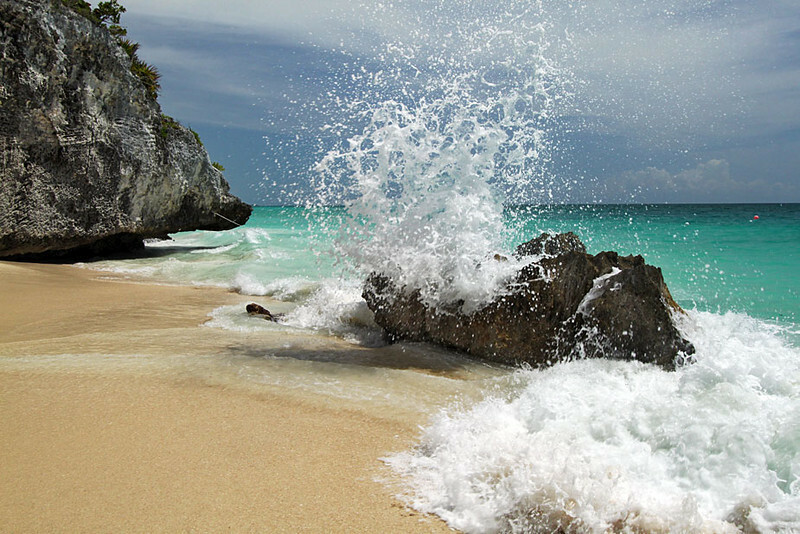 The Tulum Ruins are amazing, but the beach is pretty astounding too. This is absolutely stunning! You need to frame this!!! Hi Andi! I loved it too; thanks so much.